Despite widespread acknowledgment of the advantages of mobile computing, students in nearly one-third of classrooms do not have regular access to mobile devices in the classroom — this according to exclusive data released to THE Journal by the national education nonprofit Project Tomorrow. Project Tomorrow has been collecting data on the use of technology in American schools on a massive scale for more than a decade. Since 2003, the organization’s Speak Up Research Project has involved more than 4.5 million participants — teachers, parents, students, administrators and technology professionals — from more than 35,000 schools representing all 50 states. A survey involving more than 38,000 teachers and librarians conducted last fall revealed that 49 percent of educators’ schools assign devices to students for use in the classroom or allow those students to use their own, and another 31 percent have devices available for checkout as needed. 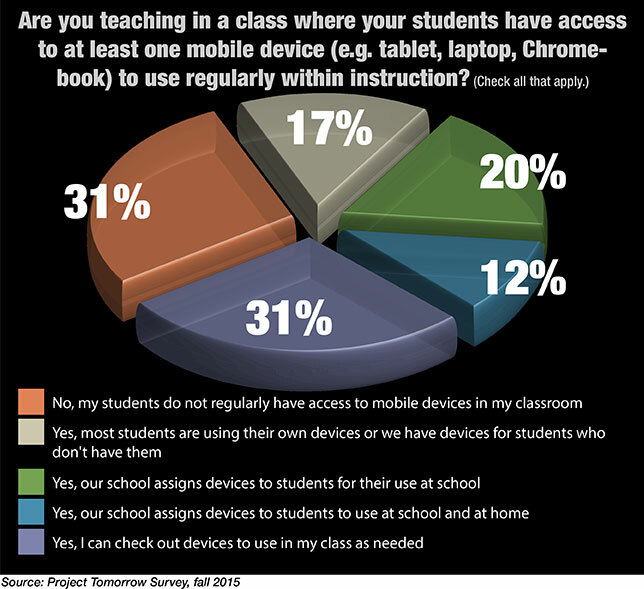 Survey participants cited a number of advantages for using mobile devices in the classroom, including enhancing student engagement in school and learning (77 percent), extending learning beyond the school day (74 percent), providing access to online textbooks (72 percent) and providing a way for students to review class materials after school (70 percent). such as laptops and tablets to improve student achievement. Improvement of communications between stakeholders, such as the ability for students to ask question via e-mail. “Stronger communications between students and teachers is a huge benefit — one that has a lot of research behind it as a way to increase student achievement. The power of the relationship, the power of communicating about what they are learning, the power of linking the family into the school process. All big impacts,” Evans told THE Journal. Project Tomorrow’s latest Speak Up Survey runs Oct. 12 through Dec. 16. To participate and view results from past surveys, visit tomorrow.org.